I post a new home inspection photo on the Structure Tech Facebook page six days a week, and this year I decided to put together a blog post showing my favorite photos from 2011. I hope you enjoy these half as much as I do. As with all of my blog posts, click on any of these photos for a larger version. 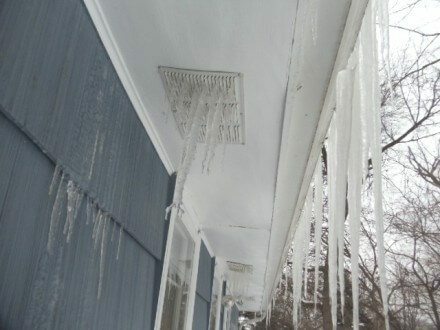 Ice Dams - Remember ice dams? They were nasty last winter. I'm enjoying winter in Minnesota much more this year; what have we received so far, two inches of snow? Ice Dam-age Control - This is the only photo we didn't take (thanks DKW3). 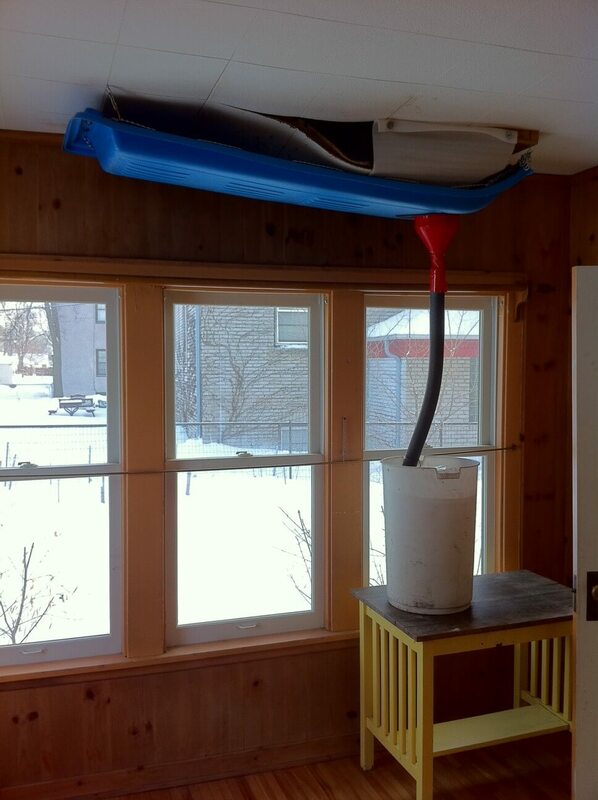 This was someone's solution to chronic water intrusion from ice dam leakage. 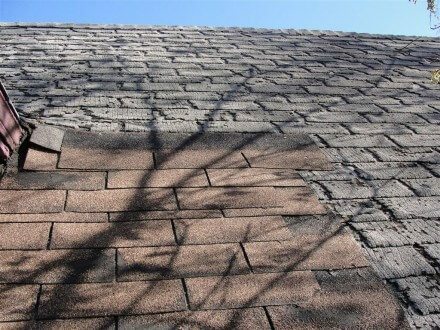 Hack Ice Dam Removal - We've said many times that pressure washers should never be used to remove ice dams, because they tear up shingles. Hot Roof? Cold Roof? Not Sure. 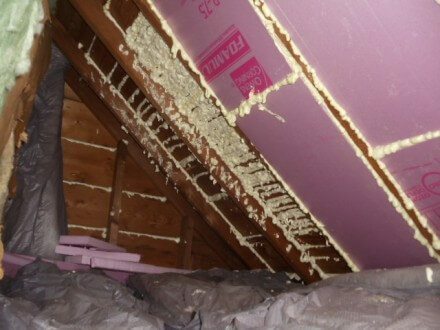 - Attics are supposed to be treated as warm spaces or cold spaces. Someone obviously didn't understand the point. Hockey Puck Fascia Repair - Hole in your fascia? No problem! 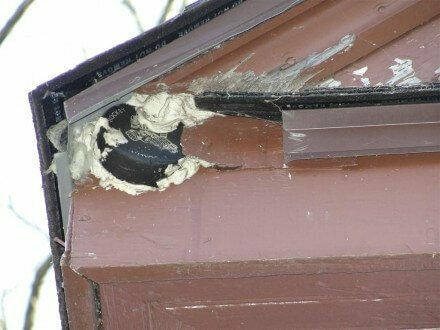 Just use a bunch of caulk and a hockey puck to fix it. Rotted Roof Decking - The roof decking was in horrible condition at this house, but that didn't stop the roofers; they installed a new roof covering right over the top. That black stuff is the ice & water shield. 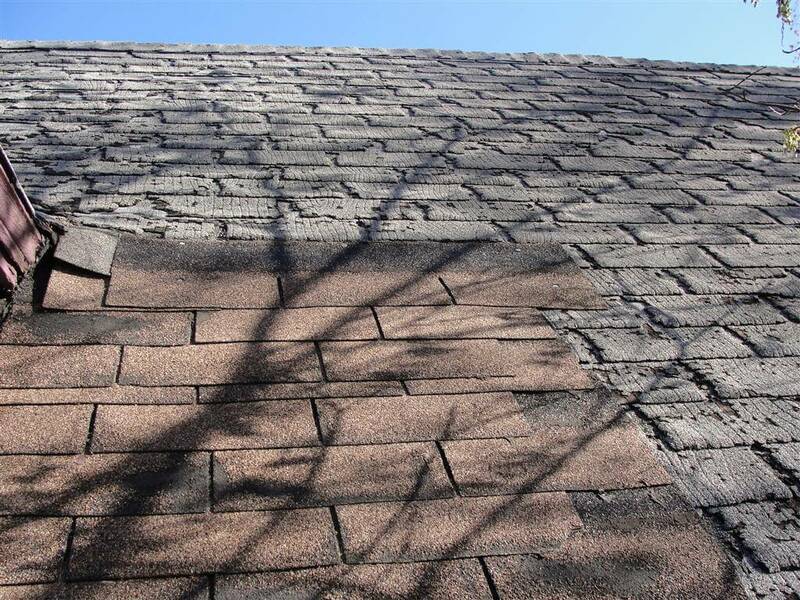 Bad Shingle Repair - No explanation needed. Bad Chimney Crown - We could tell this chimney crown needed repair just by looking at it from the ground, but we had no idea it would be this bad. 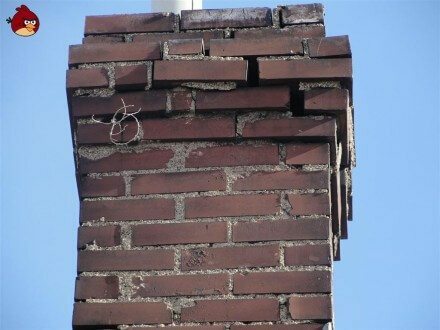 This chimney crown obviously needs to be completely replaced. Chimney with Facade Falling Apart - Three sides of this chimney looked just fine from a distance. One Angry Bird Away... - As I was typing up the insection report for this house, my wife saw this photo on the computer screen and said "Wow, that chimney looks like it's about one angry bird away from collapse." Good call. Downspout Combustion Air Intake - That downspout connecting to the return air duct fed to the exterior of the home and was being used as the combustion air intake. It's not conventional and it's probably a little small, but hey, it works. Central Air-ish - This was someone's attempt at cooling a room where the AC unit wasn't installed. Creative Heat Register - Interesting solution. Heat Register in Cabinet - While most people would have had to decide between a heat register and a cabinet here, this homeowner decided to have their cake and eat it too. Can you guess what city this house was in? Hint: Look up "cake-eater" at urbandictionary.com. Garbage Can Sump Basket - Sump baskets are reinforced on the sides to prevent them from collapsing. Plastic refuse containers are not. Mouse in Panel - Any unused openings in electric panels are supposed to be covered over, not only to contain any potential fire or sparking that could occur inside the panel, but also to prevent unwanted visitors from coming in. 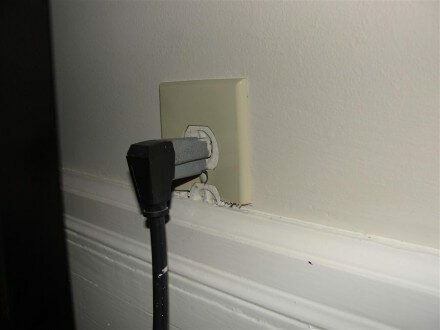 Covered Outlet - No explanation needed. 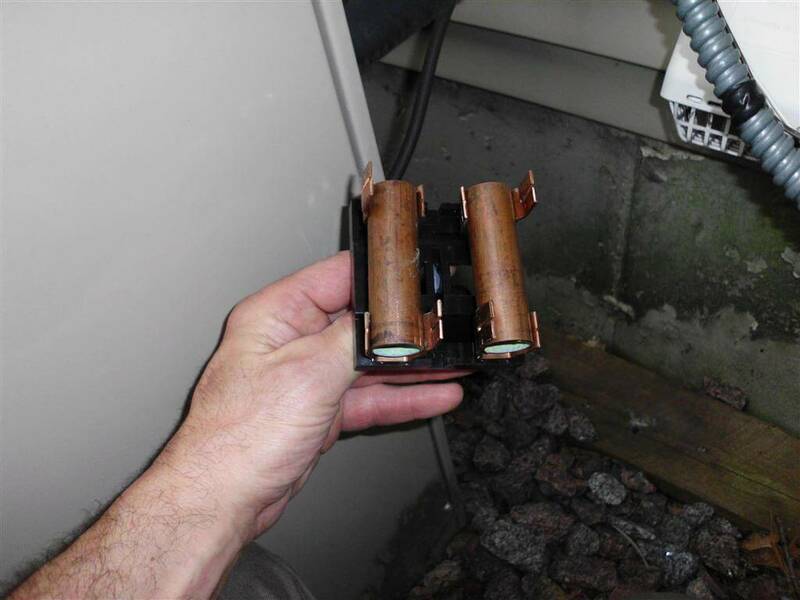 Missing Fuses - Apparently someone was tired of replacing those pesky fuses, so they replaced the fuses with a couple short lengths of copper tubing. Can you say fire hazard? 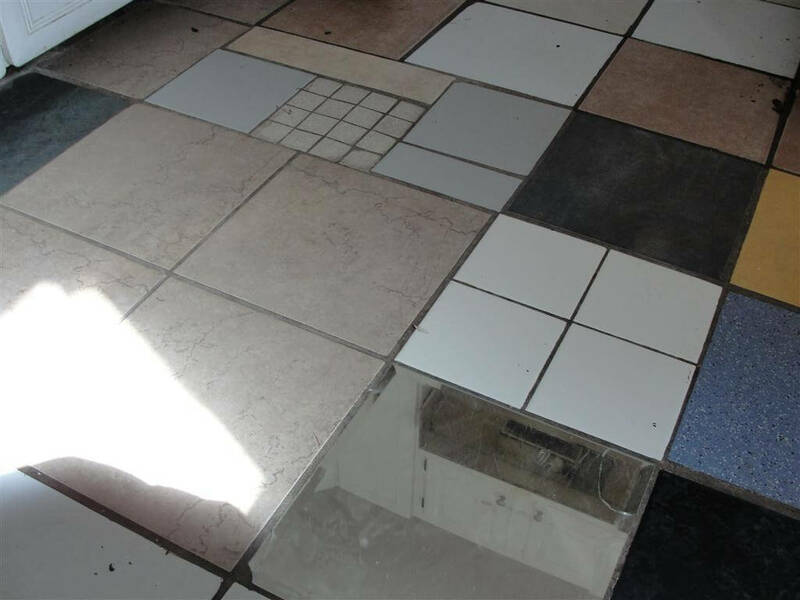 Mirror Tile on Kitchen Floor - This might be the most interesting tiled floor we've come across. Useless Shower Fan - Someone went to a lot of effort to install this bath fan above the shower, but without a duct... what's the point? I can only scratch my head. Water Behind Escutcheon - My personal favorite. I noticed water leaking out from behind the escutcheon, which is that decorative metal trim ring around the pipe sticking out of wall. I turned the water off, pulled the escutcheon away, got my camera ready, turned the water back on... click. Ok, that was twenty-one photos. Close enough. If you enjoy these kinds of photos, please click "Like" on our Facebook page. Thanks! good morning Rueben-always enjoy seeing what you come across-you could start a reality show called when DYI Attacks! These photos are terrific (I'm headed to your facebook page) The with the rat is just digusting. I would have a total melt down if I saw that! Marco - ha! I'd love to. Reuben: I agree: I great How Not To book is in the making. The camera does not lie! Well, there's so much that could be said about so many of them. At least with the pressure washer they created a nice pattern on the shingles and the sump pump guy was liberal with his use of the all-important duct tape. OMG Reuben, I'm sitting alone with a cup of coffee and belly laughing out loud...amazing! Reuben~Great photos! You often wonder what the thought process was for some of these people, and what they were thinking when they did the repairs. Thanks for sharing. Boy, those photos are really interesting. I think the angry bird and the mouse electrical panel shots win top prizes. Anne - great idea! I had over 300 photos to sort through, and that was just from this year. I could make a fantastic picture book. Michael - the one that really stumped me was the useless shower fan. Someone went to a lot of effort on that one... but for WHAT? Cheryl - those were definitely fan favorites on facebook, judging by the number of 'likes' and comments. Wow...some were funny and some were scary. It's amazing what people come up with and/or try to hide. I think photo number 2 (the funnel contraption) was the most amusing, but there was a lot of creativity in these "solutions" so it's truly hard to pick a winner. Thanks for sharing! I did not realize the beating your roofs take back in Minnesota, my goodness, it must cost a fortune to keep them in good repair. Just makes me appreciate living were the elements are not so harsh. Have a successful and healthy New Year in 2012. Those pictures are great! You must come across this stuff and shake your head (what were they thinking?!) Funny but really not so funny when the weekend warriors could have burned their houses down. We've had some pretty upset sellers when inspectors have found problems. The remedies were often expensive and they thought their homemade fixes were pretty clever. Please keep the blogs coming! Happy New Year. Fantastic photos! The winter ones remind me why I live in Florida!! I wish you a warm winter and many more amazing photos for 2012! Happy New Year! Heat register in cabinet..................San Francisco? In fact, if it weren't for all the ice, I'd say many of those shots were in sF. Great stuff, thanks for sharing it. Poor mouse. . got the death penalty because the homeowner did not keep his panels covered. .I wonder if he got a last meal of cheese. .
Nice stuff. Love the angry bird chimney. High five for your wife :) Those "fuses", I have seen that same trick a few times, scary. Reuben, this is quite a collection. When is the book coming out? Charlie - I loved that funnel too. That's the one that made this a 21 photo list; I just had to include it, even though it was something that someone sent in. Barbara - I've definitely upset some sellers with my findings. While the homemade fixes really are clever... they're usually hack repairs that shouldn't be passed on to the next owner. Diane - thanks for the warm wishes. We had a record high of 52 degrees yesterday. Loving it. While last winter was one of the harshest ever... this winter is the opposite. Anthony - Edina, MN. Anyone who grew up in the Twin Cities metro area knows 'Edinans' as cake-eaters. It's kind of an ongoing joke. For people buying a home in Edina, they always sheepishly admit that they're going to be a cake-eaters now, and we chuckle about it. Fernando - I'm sure it was very quick. Are these the "best of the best" or the "worst of the worst"? Either way it's a great post on what we find inspecting. There are a lot more things out there for us to find. Happy hunting my friend. Nice post. Hope that you and yours had a safe and happy holiday. Looking forward to more blog posts in the upcoming year! Clint - good question :) I think a good home inspection photo either makes you gasp, laugh, or scratch your head. John - we had both, thanks. Same to you. Silvia - I'm sorry, but the hockey puck fascia repair method is an 'advanced' technique. 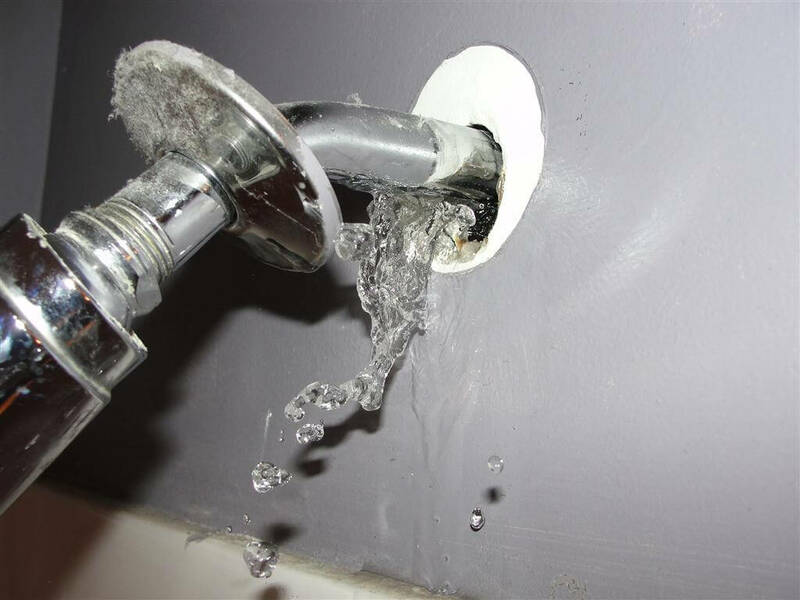 These types of repair methods aren't available to any homeowner. Those photos are hilarious! I am always amazed at how some people decide to "quick fix" some things! I laughed out loud at the hockey puck! And a mirrored floor? Yikes Thanks for sharing. That mouse didn't stand a chance! Great pics! Thanks for sharing Reuben, I couldn't resist going to your website to see if you had an archive gallery... you had a few but you should consider doing a page for each year. This is entertaining stuff and you could get a decent agent following in your area! I keep going back to the one with the hockey puck! Talk about inventive! I suppose they didn't have the cash to fix it properly and took matters into their own hand. So did the puck at least temporarily solve the question is what I wonder!? Happy New Year! Very interesting photos, I guess you do what you gotta do, right? Thanks for sharing! Hi Reuben. Thanks for sharing the photos. You have a great collection. I can't decide which is my favorite. LOL... These are great! Though, I'm sure they were't funny to the prospective home-buyers. I'm especially struck by the ice coming through the soffet vent - and that downspout used as duct work is priceless. Thanks for sharing these photos. I think the creative heat register was my favorite. I'm sure that 2012 will bring lots of opportunities for you to add to the collection. Great post Reuben! Most folks would not believe what you find on a daily basis in this profession but your photos certainly paint an interesting (and realistic) picture! They also point out an even more important fact: Job Security! I hope you have a fantastic 2012! Rueben ... Pretty interesting! I sort of enjoyed looking through these photos! Thanks for sharing them! Oh wow. This is NUTS!!! Thanks for the laugh! A picture is worth a MILLION words. I once saw a RAT short out the refridgerator motor and boy did it smell! Good thing here in Hawaii we don't have ice problems and chimneys are rare here and mostly decorative items. Thanks for the photos. Started My day with a laugh. Great photos Reuben. Let's see how creative we can get, just to do a bad job. Why don't they do it right to begin with? Thanks for the chuckle! With the electrical panel, I guess they were lucky they didn't have a "mousefire." Sorry, just couldn't resist that one. Ha! Seeing is believing - even though those are unbelievable. The "mousefire" comment was priceless. Reuben will have to add that to the book for sure and give you credit. This blog has been the most exciting thing to happen on my vacation day so far!!! Reuben....it amazes me too that people knew they were going to be having their home inspected & still left some of these "creative solutions" in place! Great photo collection! I love seeing these insane solutions to construction issues. 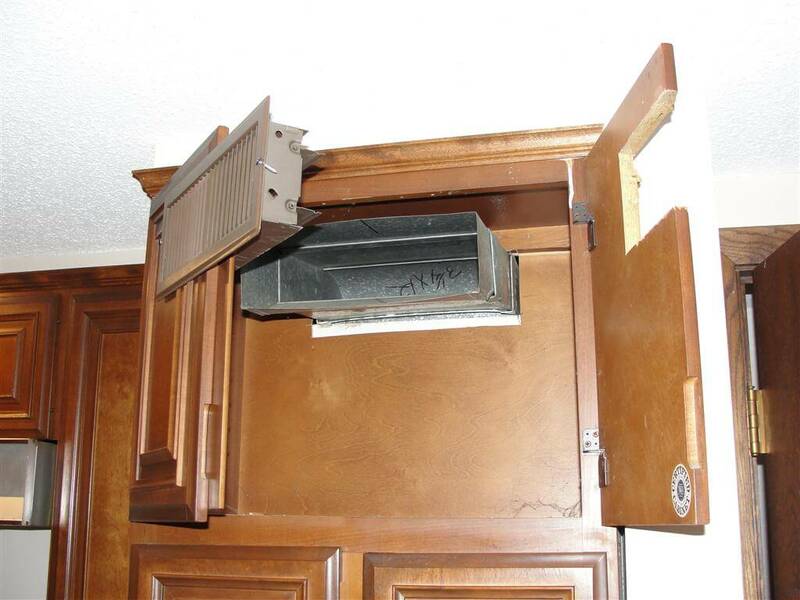 The vent in the cabinet is my favorite. And this was just one year? Not fair, you inspectors have access to SOOOOOO much fodder! Hockey puck??? But I escaped to CO in 2000 and never looked back. Great photos. Part of me wants to retire from Mortgages to do Inspecting, just for the laughs! Thanks for sharing your "best of 2011". Most of these are just so unbelievable! Laughed out loud at the Angry Birds chimney! 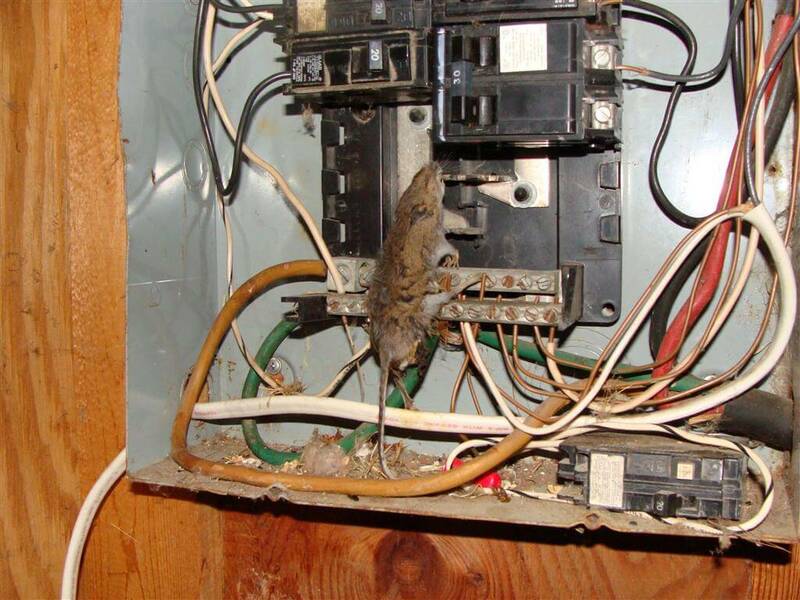 Did you put the mouse on the electric panel before you took the picture? :) Wow, makes me grateful for my homes. THanks! Great photos. I especially like the action shot of the last one. My money is that the hockey puck will be the only thing worth keeping on that roof. Here's to 2012! 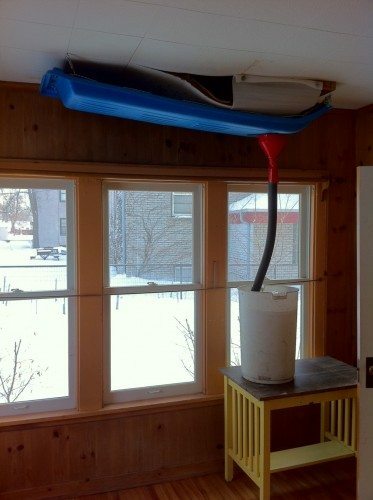 I love the 'sled' catching the roof leak and funneling it into the bucket. Genius if you ask me. Hi Reuben, Wow, those are some amazing inspection issues. Still shaking my head ! Reuben - I can't imagine what the reaction would be seeing them in person. The mouse in the panel is priceless! Wow! these photos remind us how important it is to have a home inspection. We see many interesting things in our line of work. When I see some of the stuff rigged this way I tell my clients to run. Reuban - I love the heat register solution ..... very creative ..... ideal for a person who hates those ugly metal floor registers that are always getting bent or don't function properly. Great Photos, Reuben - You inspector guys have all the fun. Most of our "special" moments from 2011 weren't the photogenic type. Great stuff, Reuben. It is hard to imaging a thought process that leads to these results. Thanks for sharing and best wishes for a fantastic 2012! Just about the time that you think you have seen it all, you see a new wonder! Reuben- These crack me up. I can relate to the hockey puck- sort of. My son shot a hockey puck in my garage and it went through and got stuck in the drywall. Of couse I removed it though! Great shots! I could probably throw a few more at you for your collection, if you're interested. One Angry Bird Away! I am always surprised by photos like these! Thanks for a few good laughs! Reuben, thanks for a great laugh. I've never seen anything like this! Oh man - the things people do to their house! I'm off to look through my photos, maybe I have a blog post in there! And I thought I saw it all!!! My all-time favorite is the sled-water-catcher on the ceiling! Happy New Year! WOW!! This is amazing! 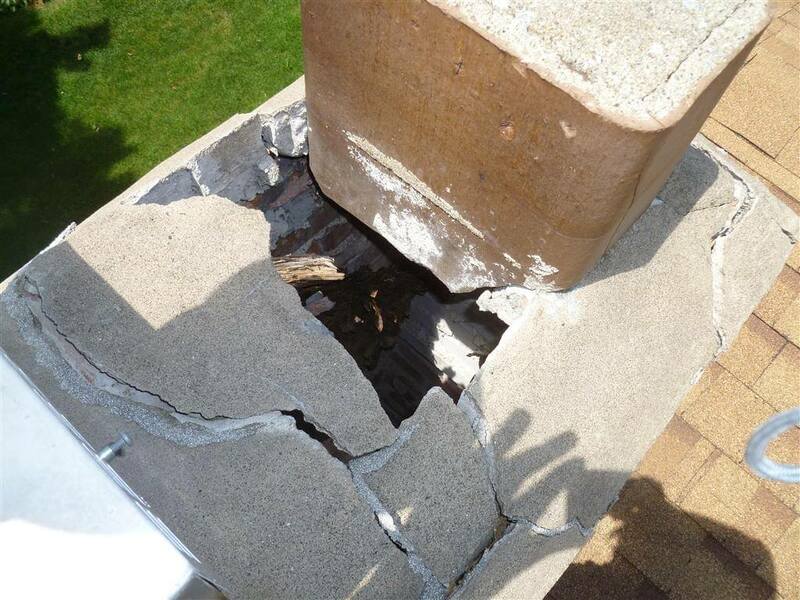 Truely frightening that these homeowners would have their homes on the market with crazy jacked up issues like this. I love the creative heat register! That is smart. The rest is horrible! An inspection is so very important. These are some incredible pictures! Thanks! Kat - I didn't even realize I was taking a photo of a hockey puck repair until I got home and looked at the photos. I laughed out loud when I saw it. Mike - great idea. I'll do it. Rosalie - I'm sure that hockey puck will last a long time. It will never rot, that's for sure. Delores - it was tough just narrowing it down to 20! Anothony - it's funny, home buyers appreciate the humor in these photos just as much, possibly even more. I frequently tell my clients "this photo is going on my web site." Richie - as always, thank you. Tamara - there is never a shortage of these. Toby - "job security"... no doubt. Thank you, DIY Channel. Lisa W - my pleasure. Emily - happy to share. Bruce - I can only imagine what that smelled like... but I'd rather not. Dawn - I can't make this stuff up. Barbara - when I post these photos on my image gallery, I'll be sure to do that. Charles - just part of what keeps this job interesting, right? Christine - I often wonder if people know how wrong some of this stuff is. Bryan - I love that one too. It actually closed quite well. Cynthia - I know, right? It also helps being part of a team of four full-time home inspectors; the other guys send me their photos. Lisa C - thanks, that was definitely a fan favorite. Joy - ha! It almost looks like a staged photo, doesn't it? Mike - I gotta admit, that last one was my favorite. Sibley - better than a ruined floor! Curtis - pretty creative, huh? Personally, I wouldn't have wasted a perfectly good puck. Mike - I didn't personally take that one of the mouse, but I'm sure I'll see one eventually. William - It really makes you wonder about everything else, doesn't it? Kathy - agreed. I'm sure there aren't nearly enough holes for proper air flow, but it's a nice concept. Jerry - these photos never end. Dave - Always! Send 'em my way, thanks. Ben - that was the only photo I 'touched up'. Connie - thanks, I'm planning to make this an annual feature. Joetta - you definitely do. I'm sure of it. Jayne - last winter seems like a distant memory. It would be really nice if we didn't have to resort to those tactics again this year in MN. Michelle - I think they could have put a few more holes in the register... but still, great idea. Reuben, duct tape with a few angry birds about to go nuts! I like this! Hi Reuben...It's amazing that more houses don't fall apart from the look of these photos. You've managed to entertain us but I'm sure not the buyers hoping to purchase these homes. Thank goodness they had the good sense to have a home inspection done. Patricia - they're all in there. Thanks for reading. Chris - and even if you remembered all of them, hey, it's fun to reminisce :). I'd love to do a show with HGTV. Great idea posting a new pic on your FB page each day. Hope you don't mind if I do the same. Great pics. That photo of the mouse in the panel box is absolutely shocking! Neat pics and very informative! Bradley - please do :). It's a great way to interact with customers / fans, and I think it helps to show how much you love your job. Richard- the mouse was thinking the same thing... for a second at least ;). Thanks. OMG Reuben. I am going to have my buyers to go this blog post if they say to me ... no home inpsection. Since we are in Colorado I cannot use you but ... great, informative, scary shots! It's hard to pick a favorite, but I'm going with the hockey puck over the cabinet vent. I loved the Creative Heat Register photo!! I HATE VENT COVERS!! :-) Can a homeowner get away with that?? Reuben- And these are the obvious ones. I never get tired of thinking about how much time and money people spend on incorrect fixes, instead of paying someone who knows what they are doing. I appreciate these people who support the importance of home inspectors. Wow, I can't tell. Was that mouse dead or alive? Love the year of photos. However, I think it might scare any prospective buyer out of their purchase!! 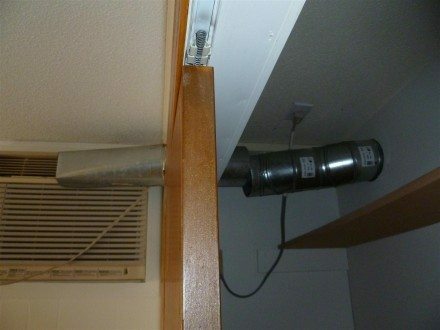 And they wonder why we tell them to get a home inspection before purchasing a home?? 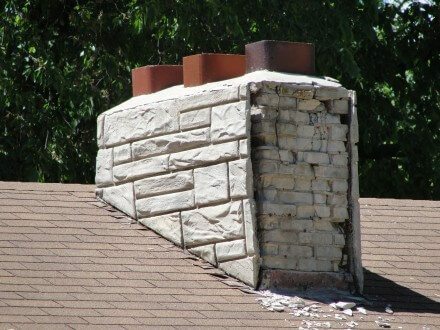 In my 25 years, I have seen home inspectors find the most hazardous fixes and the owners tell the buyers that it was professionally done, well at least some of it! Amazing we don't have more house fires with the electrical blotches I have seen in my career. Keep up the good work, so that others can see the way homeowners do repairs, make sure to ask for work to be completed by professionals and receipts provided at settlement. "Making your Home Dreams come True"
Good stuff! Why did you have to pick out my home as an example? I believe I short sold that home! Reuben - Great Shots! A terrific way to end the year with this best of the best pics post. We do see a lot of these types of problems in our travels and we are very thankful for inspectors that point these things out. Great job! Have a Happy New Year! That's so funny, I especially like the gutter/duct. I am not an inspector and have never played one on TV, but even I can spot these as a no-no. Very dangerous. Certainly love these "art" photos. Yeh, the "art" of How Not To . . . Way cool. 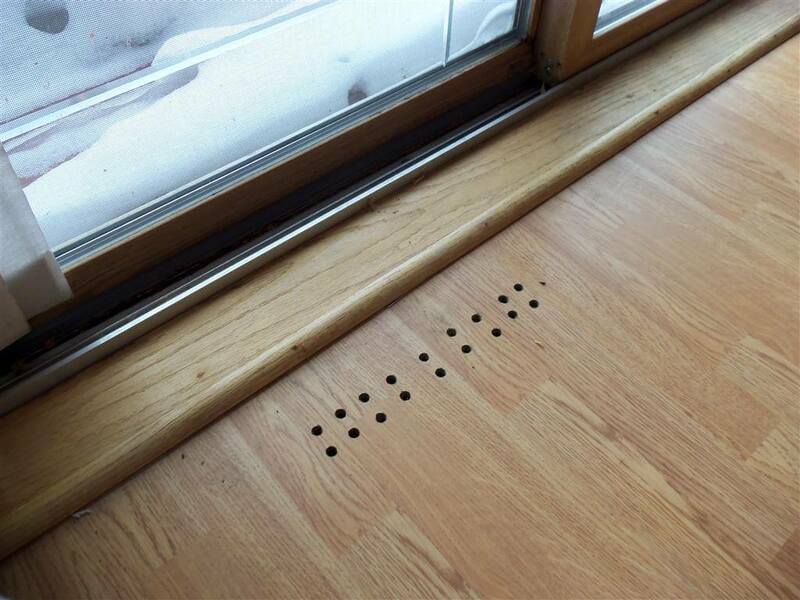 In fact, I had a listing with those holes in the floor like the photo "creative heat register" - could get no explanation of what they were from the owner, so thanks for clearing that up for me. Especially fond of the ice dam-age control. And the chimneys look familiar, too. Seen a lot of the angry bird type around here, but once in a while spy the type with the wavering facade. Recently had an inspection on a property I was shocked my buyers were seriously interested in (they found it on line and . . .). The above grade basement was not a poured slab but wood on dirt with no barrier. Of course it was rotting after more than 100 years. 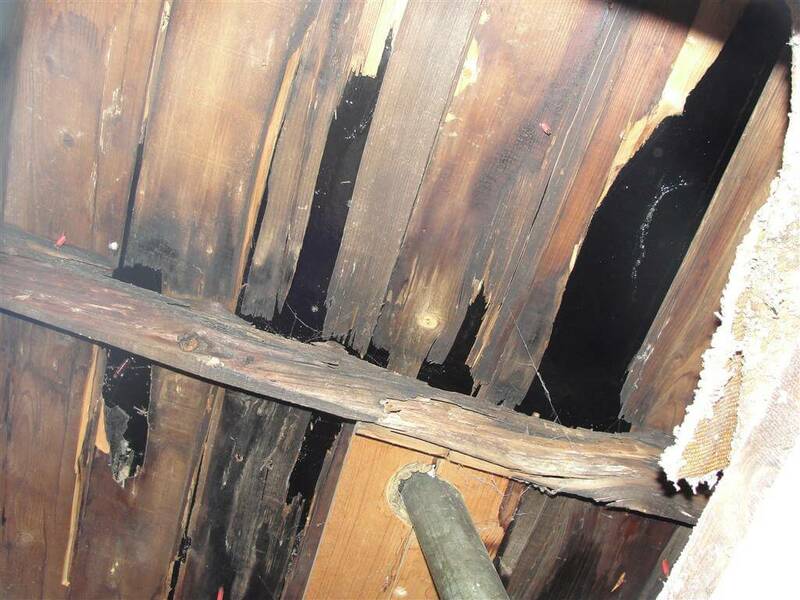 But the owners before it became REO had decided to pour a partial slab OVER the rotting wood so they could install a new water heater and zoned boiler. Did they attempt to fix the floor for the dining area or kitchen that was down there, too? Of course not. That was really a fun one. I just love tagging along after home inspectors, it is a real eye-opener and I always learn something new. Thanks to all of you for your patience and the education you give us realtors! Great photos! I'm always amazed at what home owners will do (or not do) to save money. And, when they sell, they end up having to fix it or, at least pay for it, after the inspection to make the sale happen. "Penny wise, pound foolish" is the old English saying - true! I have a room that needs air, and I think I have some extra downspouts in the garage. That's ingenuity for ya. I love the idea of sharing these finds on facebook, and hope you don't mind if I use your idea. Love it. This is why I love being a home inspector...you will never see it all! I'm building my list now so much material it's "hard" picking the best. People's inginuity seems to know no bounds. Even though I write up and condemn their mistakes, I sometimes admire the fact that they had a problem and devised a solution all on their own. At least they gave it a shot right? 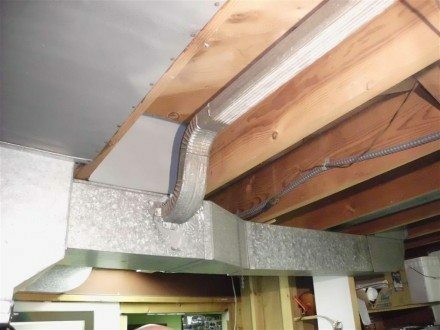 One of the funniest I saw this year was a basement bathroom exhaust that terminated into the return air duct for the whole house. Just a bad idea, lol. Pretty cool pics. One house I showed several times some winters ago had an electrocuted squirrel hanging from the overhead wire by the front door. Nothing says welcome home like that little mouse in the panel or the roofing showing through from below, although the sled system for catching the water may take the cake. It probably took a while to rig that up. A while that could also have been used to do it right. Hey Reuben, exactly what kind of load would it take to "blow" those two pieces of copper pipe?? :-) I think I smell smoke..... thanks for sharing! WOW! I've seen a lot of what I call "Harry Homeowner" repairs, but these rival anything I've seen! These pictures are unbelievable! I hope that mouse was dead! And copper tubes for fuses?? What are they thinking? I read all about ice dams, but I'm still not sure I know what they are. Are they just melted snow that collects in the gutter? Amazing pictures! You never know what you are going to find in your business. Thanks for the great pictures! I'm dealing with a BAD short sale, and sure needed a good laugh......Keep up the good work! Are my eyes deceiving me or is that a sled on the ceiling? WOW, I must say I haven't come across anything like hwat you've seen. And to think, these were just pics from 2011? Oy! You have collected so many great photos. Look amazingly terrilble to me Reuben. Oh no, the picture won't display on my computer, but I imagine what they look like. Was that mouse dead or alive? Have a great 2012!! That is a terrific collection. Happy New Year. Unbelievable. I've never seen anything like that before. Thanks for expanding the bandwidth. Reuben, by far is one of the best this week/month/year. The ingenuity of idiots is priceless. Love the post and quotes. My favorite for some reason is the gutter/duct. I don't even know where to start. We do not have ice dams around here, but I did some insurance claims in the mountains and learned when I was an adjuster. You should send this to David Letterman! There's some pretty scary stuff here, but not all that surprising. Wonder what HGTV would have to say? Hi Rueben, thanks for sharing. Some scary, some almost funny like the outlet! Wow, there is some creativity with some of these, some lack of completion thinking on others and some that do just make you scratch your head. I like the sled and plunger ice dam solution! Creativity and ingenuity abound, but most seem to have not really thought the whole thing through. Thanks for the laughs! Oh my gosh! Thanks for sharing! 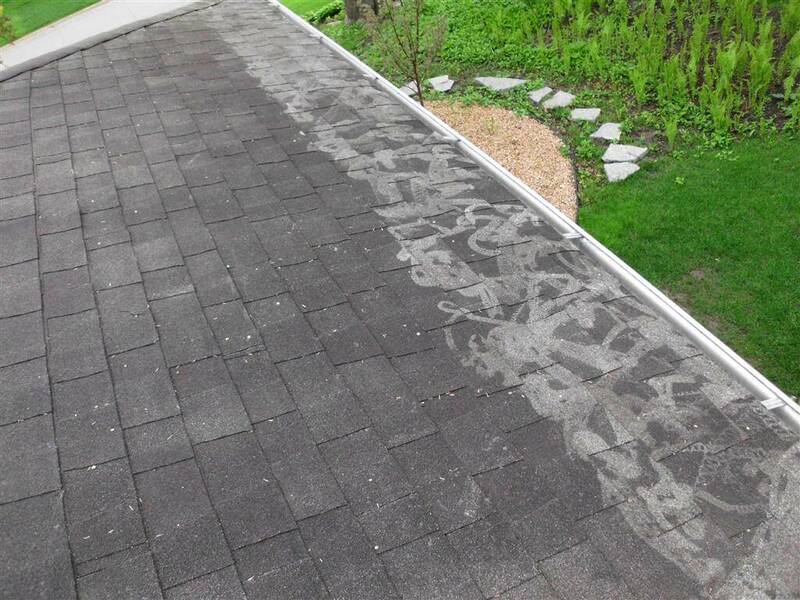 These look like much older homes and folks have just done some really bad patch jobs in a hurry! Reuban ~ It is amazing the kind of imagination some homeowners have when it comes to fixing things in their own house! I am sure you see everything! I LOVE these pictures - even the ones with ice. Having lived in MN, I can certainly appreciate the Scandinavian creativity of problem solving. As for the others, wouldn't be uncommon to see a mouse in the electrical panel box here in SC. You must have fun days when you discover such amazing circumstances. 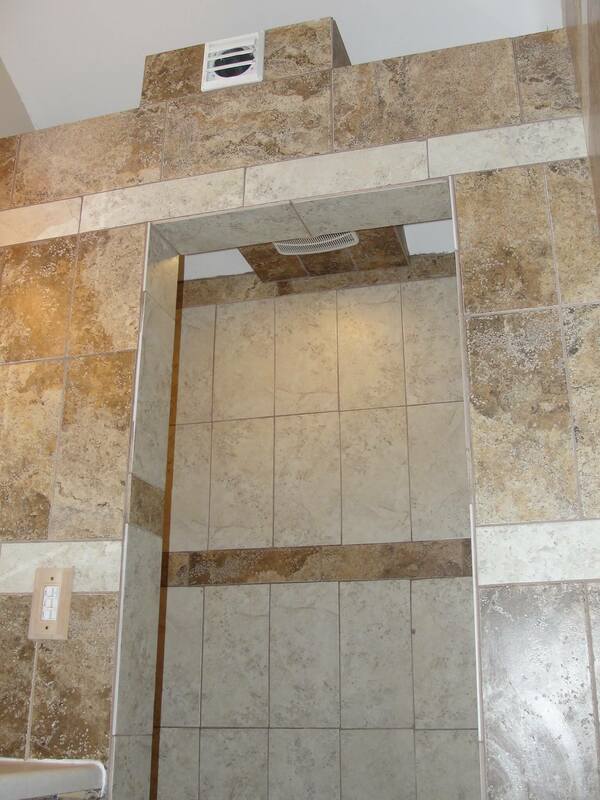 Very nice pictures and they tell us as well as buyers how important it is to hire extremely experienced inspector. Can I show these pictures to my stuborn buyer clients who do not take inspection seriously? I love the photos :) The 'creativity' of people is fantastic (and sometimes dangerous). Great pictures, Reuben. Of course, in out-state Minnesota they never do things like that. NOT! Reuben, That was great. Made me think of all the crazy stuff I saw this year. Must of been fun culling just twenty ; ) Happy New Year and belated X-mas. Reuben - Wow - these are some interesting photos. You seem to have some issues we don't see here in North Carolina. Nest of 2012 to you! These are great, Reuben. Thanks for sharing! To the people who left the last 50 comments or so - thank you! I plan to respond to any questions within the next day or two. Oh, my! Amazing what people will do! I missed this one, Reuben! These are awesome! I have seen a few head-scratchers but not like these! Reuben - You could have supplied a years worth of "Postcards from the Field" for the ASHI Reporter. Great blog!! Nice information here. Indeed, Home inspection and home repair knowledge is a must to have when investing in rental property. It helps to know the basics of what is involved with many repairs for you can save a lot by doing so. Wow! I bet you guys really see it all. My favorite is definitely the mouse in the electrical box, but the mirror tile is definitely a classic as well. 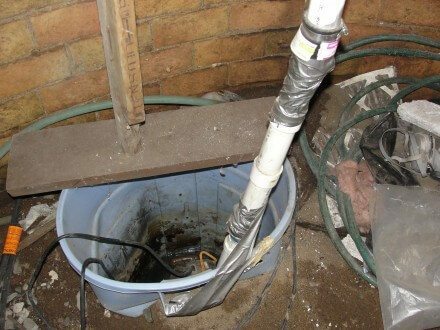 Great photos that show the value of a home inspection! Sometimes you wonder "What were they thinking?"